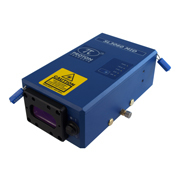 Provide high-speed, non-contact, solid-state laser speed and length measurement with no slippage, drift or mechanical wear and greatly reduced maintenance compared with contact wheel / roller systems. Are accurate to better than 0.05% and repeatable to better than 0.02% with UKAS-traceable calibration. Are available in stand-off distances and depths-of-field to suit applications as required. Speed and length measurement for unidirectional applications. 150, 300 and 600mm stand-off distance models available. Line speed measurement and control. Non-contact, slip-free and low maintenance replacement for wherever contact wheel / roller systems are used. Speed and length measurement for bidirectional and zero-speed applications. Reports correct speed and length during line stoppage (zero speed) and direction reversals. Quality inspection rewind lines for flaw position logging and line reversing for flaw rework. 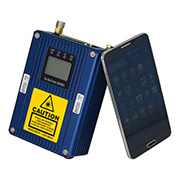 EU MID-certified speed and length measurement for unidirectional applications. 300mm stand-off distance (60mm depth-of-field) model available (MID certificate no: UK/0126/0089). Fitted with PROFIBUS and EtherNet/IP communications interfaces as standard. May be ordered with an optional external RS-232 printer for batch length ticket printing. Final shipping length measurement for products destined for EU-markets (EU Directives 2014/32/EU 2004/22/EC). 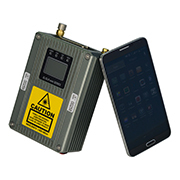 EU MID-certified speed and length measurement for bidirectional and zero-speed applications. 300mm stand-off distance (60mm depth-of-field) model available (MID certificate no: UK/0126/0120). Final shipping length measurement on bidirectional rewind lines for products destined for EU-markets (EU Directive 2014/32/EU). Unidirectional speed and length measurement in metals industry applications. 600, 1200 and 2000mm stand-off distance models available. Optional infra-red filter available for hot object applications. Optional harsh environment enclosures with air or water cooling and air purge available for hot, steamy or dusty environments. Line speed control on extrusion or forming lines. Differential speed control using a pair of gauges (for hot or cold sequential rolling mills). Bidirectional and zero-speed speed and length measurement in metals industry applications. 600, 1200, 2000 and 2500mm stand-off distance models available. Unidirectional speed and length measurement optimized for sheet and converting applications. 120 and 300mm stand-off distance models available. Bidirectional and zero-speed speed and length measurement optimized for sheet and converting applications.